Our latest meeting of 2017 was a very lively occasion. First we were all warmly greeted at the door by our hospitality person, Dave Henson, who welcomed guests and members alike and handed out name badges to everyone. The meeting was opened by our acting Sergeant at Arms, Richard Green, who then handed over to our President, Paul Andreas. Paul announced the creation of a new committee, the Nominations Committee and encouraged members to join it. Its role will be to oversee the election of the new committee, which is likely to happen in May. Richard M is looking for two people to join him on this Committee, so please see him, if you’re interested. Our VPE, Susan, then encouraged us to stand for the main committee and especially to stand for her role of VPE, which she then went on to describe. Our Toastmaster for the evening was John Cross, doing the role for the first time. 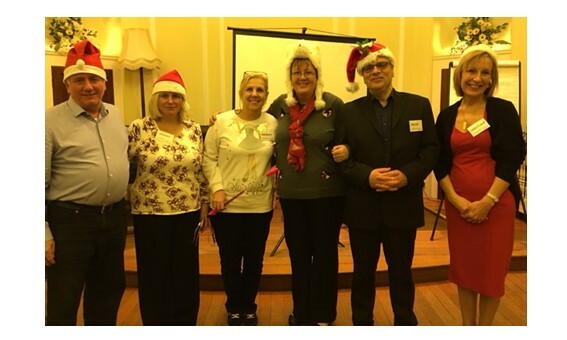 He introduced his team to us comprised of Timekeeper – Susan Rayner – Timekeeper, Richard G – Ah Counter and Grammarian, Warm up – Martin, Hot Tip – Karen. Martin led the Warmup by asking members to share things they were passionate about, which was appropriate, as we had just celebrated Valentine’s Day. Our first speech was by Paul A, with Speech # 4 from the CC Manual titled “Was it or wasn’t it (a conspiracy)”. He gave us several reasons why he thought the assassination of JFK was a conspiracy, including the fact that the “House Committee on Assassinations” had said it was. Our second speech was by Margot with a speech called “A Postcard from America”, which was Speech # 2 from the CC Manual. Margot gave an amusing account of her four-day holiday in New York, which coincided with a hurricane so that everything was shut down during her stay. The third speech was by Riya with Speech # 5 from the CC Manual called, “What goes around comes around”. This was a story with a moral about someone who helped an old lady whose car had broken down and in turn was rewarded, in a wonderful way. After the break Annelise led the Table Topics with some very interesting questions one of which led Tony to share an amusing story about how he got his first kiss. Then onto the Awards. Christine won the Table Topics award, Richard M won the Best Evaluation Award for his evaluation of Riya’s speech and Margot won the Best Speaker Award for her American holiday speech. 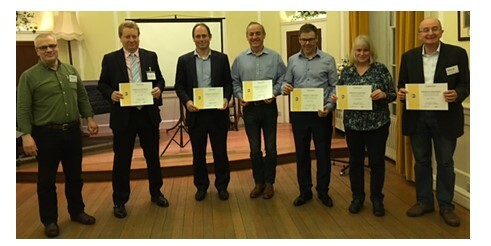 Richard M was then presented with another award – his CL Award that he has achieved for the second time! Paul A then reminded everyone about our extra meeting on 23rd February and then drew the meeting to a close. A big thank you to all those who took on roles and gave speeches and helped to make the evening a great success. 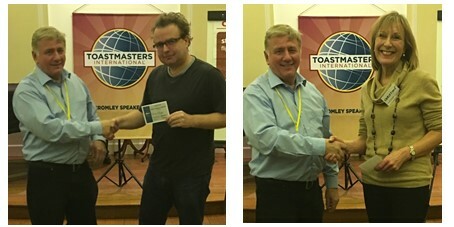 A special thanks and kudos (our word of the day) to John, who did a great job of being the Toastmaster for the first time. Our next meeting will be held on Thursday 23 February, which will be a special Speakathon. We have six speakers and we still need one more Evaluator. On a dark and cold night when others didn’t dare venture out, the members of Bromley Speakers turned out en masse for our first February meet up. There was a warm welcome as you stepped through the door of The Ripley Arts Centre and visitors quickly found that there were members willing to share their experience of Toastmasters and answer any questions. It was great to see ex club President Joe, and our past Area Director, Samir and Paul Rhys-Taylor from our District Committee. Neil our Sargent at Arms efficiently ensured that everyone was ready and seated so that he could introduce club President, Paul on time. Paul reminded members that there will be an extra meeting in February on the 23rd. This meeting will be a Speakathon with six speeches. The places will be primarily for newer members wanting to do CC1 to CC5. To book a place contact Susan Rayner or enrol via Easy Speak. The clubs International Speech Competition and Evaluation Competition will be held on March 16th. Competitors must have completed the first six speeches in the Competent Communicator manual. The club also needs judges, counters, ushers etc. to run the event. Please speak to Dave Henson or Susan Rayner if you can compete or help. Everyone is encouraged to take part in the event, as you don’t know what you can achieve, until you have a go. Even if you do not have a role, please come along to the meeting as an audience is needed to clap, laugh and respond to the speeches. Simon was our fabulous Toastmaster. 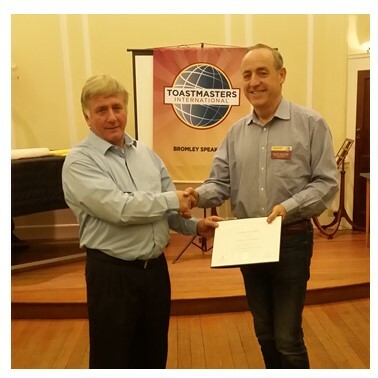 Simon has been a member of Bromley for four months and a Toastmaster for four years. His humour and energy were on show from the moment that he took control, to the moment when he handed back control of the meeting to our club President. We all loved his phrase, that Toastmasters ‘changes your brain without drugs.’ In other words it is life changing and allows you to step up successfully to take on new challenges. Alexanderz was in charge of the lights at his first meeting after becoming a member. Congratulations Alex on a great job. Clear and succinct reports throughout. Dave took on the roles of Ah Counter and Grammarian. It was a sign of the quality of the meeting that ten members did not use any filler words such as ahs or ums. Another six had only one or two. Our musician Luke was in control of a very different warm up. One by one the members joined in until the room was filled with a glorious sound. Carrie was in charge of the Hot Tip which was, ‘believe in yourself, stand up and get on with it’. Good advice which was well delivered. Christine was the first speaker. Her talk was titled, ‘giving up is so very hard to do’. A personal story of her struggle with cigarettes. It was also interesting to reflect on the changes in attitude over a relatively short time. Next up was Annelise with, ‘welcome to my digital world’. Again a speech that reflected on changes in her lifetime which included, vinyl to downloads and phone kiosks to Skype. The last speech was from the very experienced Chris, delivering a Special Occasion Speech from the Advanced Manual Series. Chris praised his friend Kevin who has given a lifetime of service to the RAF cadets. The applause was both for Chris and Kevin at the end. The three speech evaluators were Riya, Richard M and Richard G. Each found much to commend from the speeches that they had heard. They reminded us that a personal story can give the audience something that they can relate to. Also, that if the purpose of a speech is to inform, to make sure there is content that the audience will want to know. Our session on Impromptu speaking, (Table Topics,) was led by Alain. His theme was ‘nature or nurture’. A great selection of subject matter that all the respondents could tackle well. Georgina gave the evaluation on Table Topics suggesting points for improvement, as well as commendations. She gave a very well structured review of the session especially as it was her first time. We look forward to many more evaluations from her. Paul G rounded off the evaluations as General Evaluator in his own inimitable style. Upbeat and very energetic. 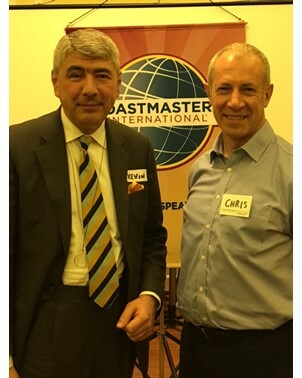 He gave two great bits of advice; after a meeting reflect on what you have done; and, to take all the opportunities that you are offered at Toastmasters. 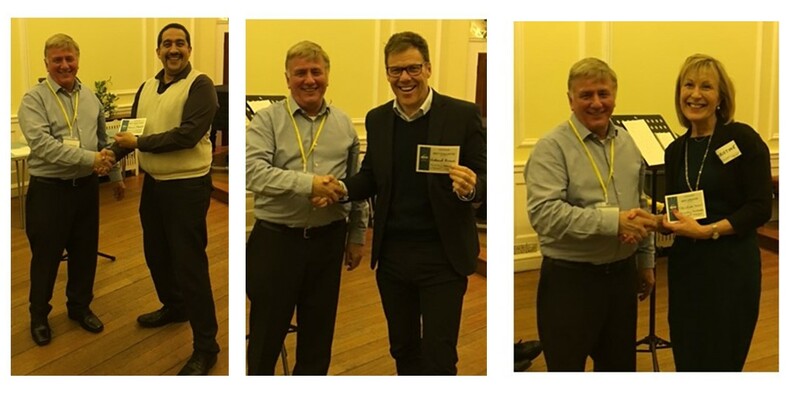 At the end of the meeting, awards were presented by the club’s President to Samir (Best Table Topic), Richard G (Best Evaluator), Christine (Best Speaker). Not wanting the evening to end, many members and friends of Bromley Speakers, headed off to the local ale house to reflect on the learnings of the evening. The next meeting is on February 16th. 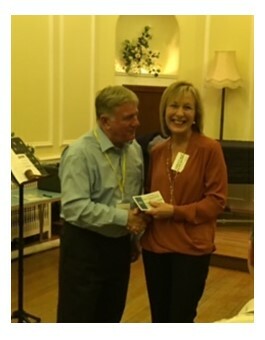 Simon, our Sergeant at Arms, cheerfully started the meeting and handed over to the President, Paul Andreas, who welcomed everyone and then made a presentation to Susan Rayner our VPE. laid on some music and provided lashings of food. Thank you Susan. Our Toastmaster was Jenny Andreas, who joined us only a few months ago and was being the Toastmaster for the first time. Relaxing, whilst other members revealed that they did not like ironing and that they had just discovered someone who could do their ironing for them! This was followed by three speakers, Riya, Georgina and Jenny T. First Riya gave an excellent talk about the power of using a story in a speech. This was followed by Georgina who gave an entertaining speech about her beagle and proved to us what lovely pets they made. This was followed by a call to action to buy your own puppy as she new a beagle breeder who had some puppies for sale! Then Jenny T tried out a speech on us that she wants to give when she goes into prison – as a visitor. We found it entertaining and Jenny found it useful as she prepares for prison. 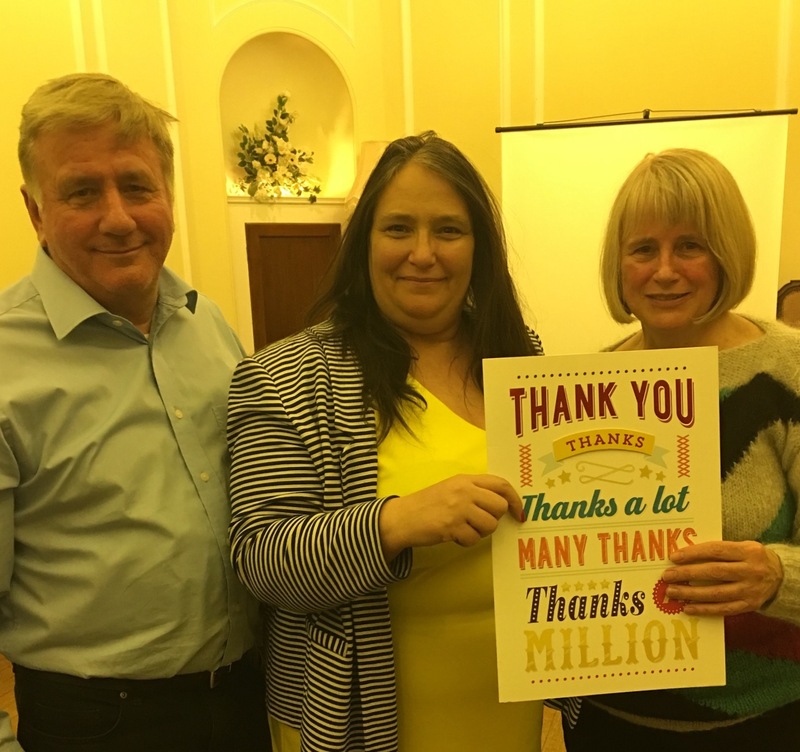 The speeches were then evaluated by Richard Murray, Paul Lynch and Karen Mefflin who all gave some very useful feedback to the speakers. After the break we returned, ready for Table Topics. Martin was our TTM and had compiled some interesting questions around the theme of love and passion – things you enjoy doing. We learnt some interesting things such as Carrie likes to holiday in Thailand and Neil enjoys watching dragons! Unfortunately, our General Evaluator, Cheryn, had been taken ill in the afternoon and was unable to attend our meeting. That gave us more time for Table Topics and Martin had prepared plenty. This gave a lot of work for our TT Evaluator, Alex, who provided some great feedback for the TT Speakers. 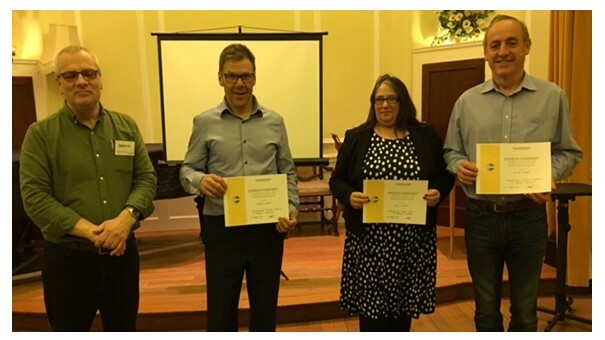 Paul A brought the meeting to a close by presenting the awards including best Evaluator Award to Paul Lynch, best Speaker Award to Georgina and the best Table Topic Award was a tie, won jointly by Christine and Simon. Thanks go to all the members who took on roles, including Timekeeper: Carrie, Grammarian: Jenny T, Ah Counter: Luke and Royston with the Hot Tip. Our next meeting will be on Thursday 2 February at 7.15 pm. We have had several new members join us recently – 12 in the last six months. There are now 44 of us. This is great because it means vibrant meetings but it also means that there are more people to give speeches. Therefore, we have organised an extra Speakathon meeting for Thursday 23 February. There should be time for at least six speeches and the priority will go to New Members who want to do a speech from # 1 -5 in the CC Manual. This should reduce the waiting time for giving speeches, which has recently grown to three months. Meanwhile, the Committee is considering other options for reducing the waiting time. For example, we may need to put a cap on our numbers soon and create a Waiting List to join. Don’t forget our club contest on Thursday 16 March. If you have completed speeches 1 – 6 from the CC Manual then you are eligible to take part. The winner of our club contest will go through to the Area, Division and District Contests and from there will get a paid ticket to the International Finals in Vancouver. Preparation is not just writing a script and learning the words. It is also getting yourself mentally in the right state to perform at your optimum. Know what you have to give the audience and what they will be able to take away from your presentation. Imagine yourself doing well and being applauded by the audience. A few days before, decide what you will wear so that you can concentrate on your presentation when the time arrives. On the day make sure you are well hydrated and rested. Arrive early to test any equipment and make sure that everything you need is in place. Before the meeting starts, walk the speaking area and familiarise yourself with the room. When the meeting starts, sit tall in your chair, with shoulders back and breathe deeply. When you are introduced, walk to the lectern confidently, with head held high. Wait for the applause to end before you start. After your speech do a self-evaluation. Applaud yourself for what went well. Consider areas for improvement. Remind yourself on what you have achieved. And of course, attend Toastmasters meetings regularly and say yes to the opportunities that you are offered. The more you get involved, the more that you will feel confident about speaking in front of other people. 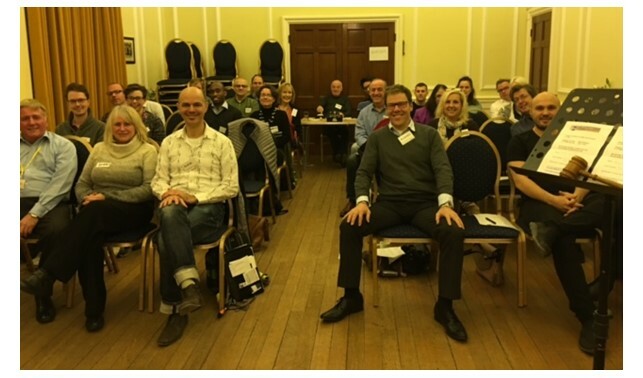 It was a great way to start the new year by coming to Bromley Speakers. Everyone was happy to be back so it was a good occasion to take a photo for our website. Neil, our Sergeant at Arms, started the meeting and handed over to the President, Paul Andreas, who welcomed everyone back from the break. Our Toastmaster was Richard Murray, DTM, who is very ably working his way towards his second DTM, so the meeting was in safe hands. Then Alain got the meeting going with a laugh by asking, the Warmup Question, “What makes you smile?”, which got some interesting responses! Our Speaker was Royston, giving his Icebreaker speech and providing an opportunity for us to learn more about him. His speech was evaluated by Annelise who commended Royston for his speech and gave him some tips to improve for his next speech. This was followed by a very useful workshop by Richard Murray, on how to construct a speech. With the help of a Flipchart, a Mindmap and contributions from the audience, Richard was able to create an outline of a speech. The speech was called Charity Boxes, which is one that Sue intends to give. So, everyone benefitted from the workshop and Sue benefitted because she now has an outline for her next speech! After a break for tea, coffee and biscuits we returned, refreshed and ready for Table Topics. Jenny A was our Table Topic Master and had compiled some interesting questions around the theme of looking forward to the year ahead. She was very business like and, by keeping her contribution to a minimum, she managed to ask thirteen questions. Is this a record? That gave a lot of work for our Table Topic Evaluator, Sue, who was well up to the task and provided some very useful feedback for the Table Topic Speakers. Table Topics was followed by an informative General Evaluation from Neil, delivered in his usual upbeat style. Paul A brought the meeting to a close by presenting Christine with an award for the best Table Topic and by thanking the guests for coming. The meeting was then finished off at the Anglesey Arms where many members went afterwards for a convivial drink and a chat. Thanks go to all the members who took on roles, including Timekeeper: Eddie Barnes, Grammarian: Jenny T and Ah Counter: Georgina. Also a big thanks to John Cross, who made a special journey to help to set up even though he wasn’t feeling well and Simon Maggs, who made a special journey to give the Hot Tip and help with Hospitality before leaving early for a charity meeting that he had to go to. Our next meeting will be on Thursday 19 January at 7.15 pm. Our last meeting of 2016 was a very festive occasion. First we were all warmly greeted at the door by our hospitality person, Georgina. In the meeting room we all sat round tables which had been decorated with table cloths and snow flakes and laden with goodies like mince pies, chocolate rolls and drinks like Schloer, juice and coke. Our Toastmaster for the evening was Dave Henson who was festively dressed for the occasion and explained to us the new format for the evening and introduced Annelise, our Timekeeper. Christine led the Warmup by asking members to share their favourite Christmas music. Some brave members actually sang parts of the songs, including Royston, Georgina and Juan, who sang beautifully in Spanish. Our first speech was Sue Shaw, with Speech # 2 from the Humorous Speaking Manual titled “The gift of . . . “ Sue entertained us with a speech about Christmas, beginning and ending with a humorous story, embellished with some awesome looking props! Our second speech was by Richard Murray, who entertained us with speech # 5 from the Speaking Manual, about his experiences with dyslexia. Richard stuck labels to himself to illustrate how he had been labelled as a child but his speech didn’t quite go to plan as the labels kept falling off!! This was followed by a time of open feedback when, instead of completing a feedback slip, members told the speakers their commendations and recommendations. As a result the speakers received some very useful tips. After a short break Simon led “Table Topics with a Difference”, which was a game of “Pass the Parcel”. When the music stopped the recipient unwrapped a layer of Christmas paper to reveal four chocolates and a Topic. The topics were all about Christmas and we learnt some interesting facts such as it snowed from December to March in 1963, and in that year Dave was unable to ride his new bike for three months and Richard broke his teeth going down a slide. After each Table Topic Simon chose someone to give an immediate verbal evaluation. The very last layer was unwrapped by Eddie Barnes to reveal a box of After Eight mints. Congratulations, Eddie. After this our President, Paul Andreas, led a quiz based on the things that we had just heard in the Table Topics session, such as, “Who Played Secret Santa?” Each correct answer was rewarded with a chocolate. Then on to the most important part of the evening – the Awards. 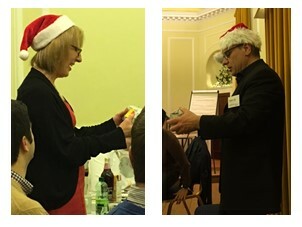 Paul announced that Richard and Sue were equal first for Speeches and presented their awards – chocolates. 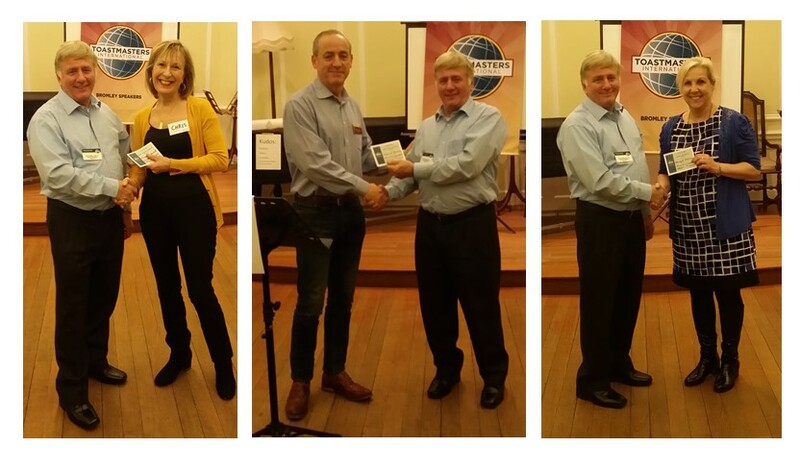 The Table Topics was also a tie – we had ten equal winners! Then we used a Clapometer to decide who was the most gaily decorated person. 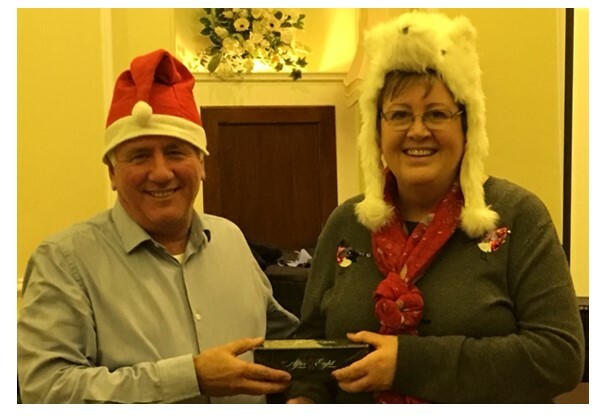 Sue won this and we had three runners-up – Dave, Margot and Christine, who were all presented with awards – chocolates. Congratulations to everyone. Paul Andreas then drew the meeting to a close and wished everyone a Happy Christmas and a Blessed New Year. A big thank you to everyone who contributed in some way and helped to make the evening a success. After the meeting a little food was left and we gave a bottle and some chocolate rolls to Kevin, our Caretaker, as a Thank You for looking after us so well during the year. Our next meeting will be held on Thursday 5 January. Meanwhile, I wish everyone a Happy Christmas and a very blessed New Year.